Receive updates on my recipes, lifestyle posts, etc. A super easy and delicious take on traditional Shepard’s Pie! 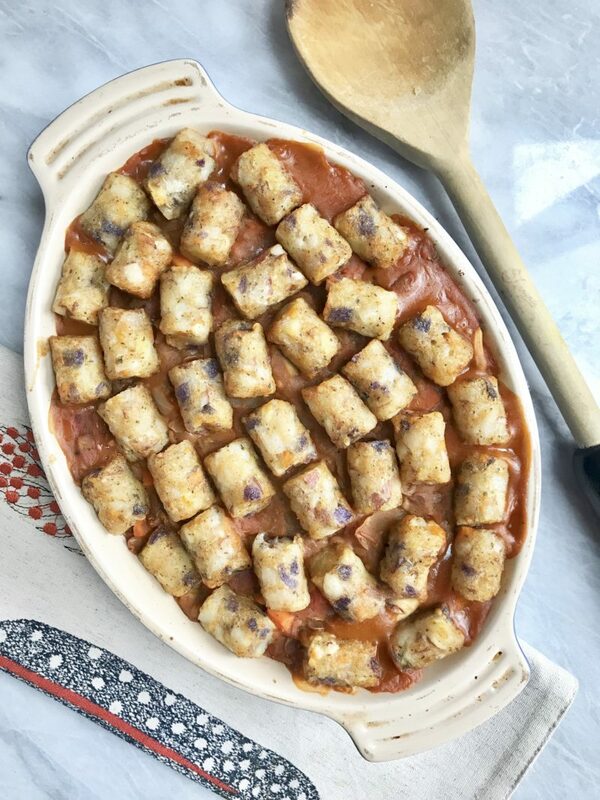 With Thanksgiving around the corner, I thought it would be fun to create a super easy take on a traditional Shepard’s Pie! 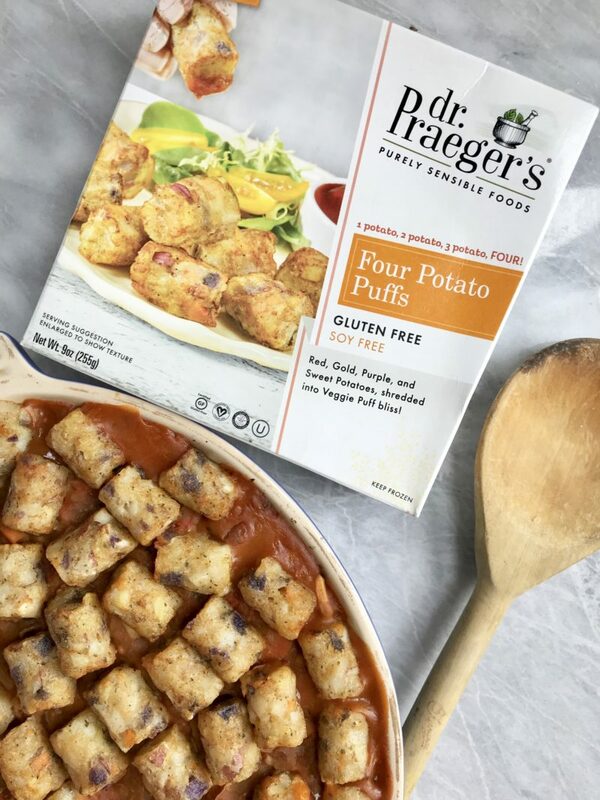 What makes this recipe SUPER amazing and delicious are the Four Potato Puffs by Dr. Prager’s. 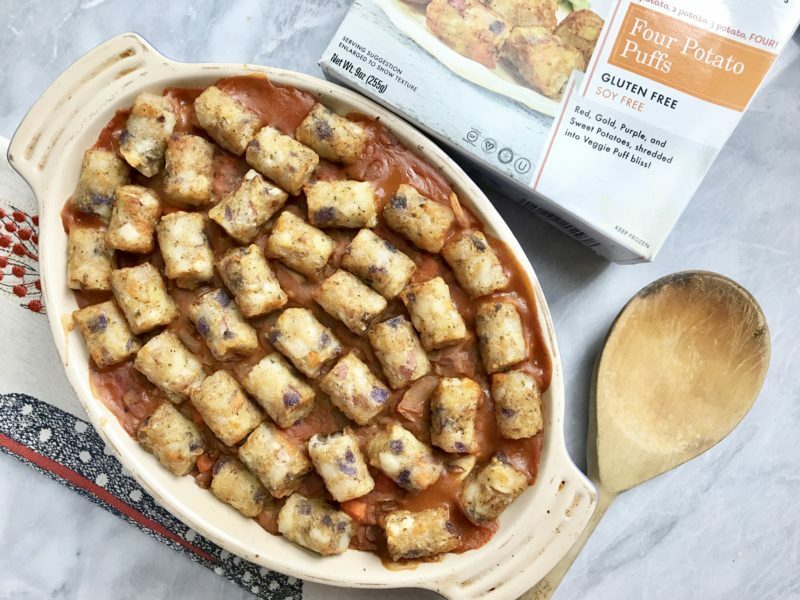 These potato puffs have four different types of shredded potatoes in them (red, gold, purple & sweet potato) and are the perfect fun topping for your dish. They’re also totally kid approved! The base of the filling of this pie is lentils! Lentils are such a great meat substitute. They’re high in protein and have a really great texture to them! We also have other veggies like onions, carrots & mushrooms. The real start of this dish are the potato puffs. The ingredients are super minimal but taste amazing! Dr. Praeger’s also makes Carrot & Kale puffs, which would also be perfect substitutes if you wanted to add more veggies! The great thing about this dish is that you don’t have to pre-cook the puffs. They cook at the same time the other veggies cook while in the oven. It takes MUCH less time than doing mashed potatoes and are a creative way to spice up your holiday dinner. The Dr. Praeger’s puffs become super crispy adding a really great texture to your shepard’s pie! It’s the perfect topping to elevate this traditional dish! I hope you enjoy! If you ever make any of my recipes, don’t forget to tag me on Instagram @plantbasedjane so I can see! Pre-heat your oven to 375 degrees Fahrenheit. Chop up your veggies, and in a large pot or dutch oven, heat up some olive oil. Add in your onion and sauté for 2-3 minutes, or until fragrant. Add in your garlic and cook for 30 seconds. Add in carrots and mushroom and let cook for 2-3 minutes. Wash & drain your lentils. Add them to the pot and stir for 1-2 minutes. Then, add your tomato paste and stir to combine. Add in your tomato puree and spices. Cook for 2-3 minutes on medium heat then reduce to a simmer and let sit for 10 minutes. Optional: to thicken the mixture, combine around 3 tablespoons of water with 2 tablespoons cornstarch. Add back to mixture and combine until thickened. Add your mixture into an oven safe dish and add your four potato puffs on top. Pop in the oven for 25 minutes. Thank you to Dr. Praeger’s for sponsoring this post. It means a lot to me to work with brands I love and support my blog!